Their coat is a grey/brown colour with distinctive black markings and a light coloured underside. 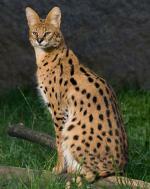 They have tufted ears, long whiskers and wide feet. The Iberian Lynx is mainly nocturnal but during the winter months it is active during the day. The Iberian Lynx inhabits the open forests and thickets of the Iberian Peninsula in South West Europe. 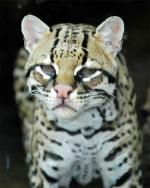 They are solitary animals except for mothers that have young. The territories of males often overlap the territories of several females, and they mark these by urinating on trees and rocks. 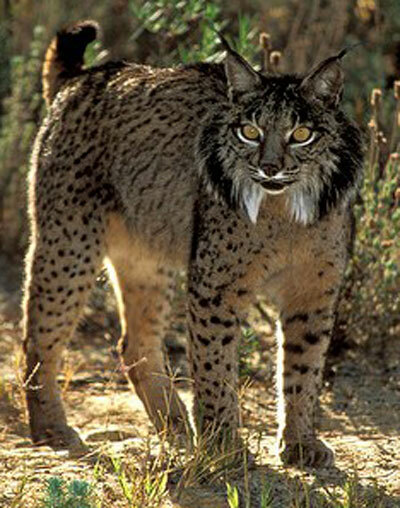 The Iberian Lynx is carnivorous and its diet mainly consists of small mammals, mainly rabbits, and birds. If rabbits are scarce deer and mouflon are hunted. If any prey is uneaten, the Lynx will bury it and return the next day to finish it off. After a gestation period of approximately 60 days the Iberian Lynx gives birth to a litter of 2 - 3 kittens. The kittens become independent after about 10 months but they will stay within the territory to which they were born until they are about 20 months old. A female will not breed until she has established her own territory, this could take up to 3 years or in some cases this may never happen. The main predator of the Iberian Lynx is man but they are now fully protected by the law. There are no subspecies of the Iberian Lynx. The Iberian Lynx is thought to be the most endangered feline in the world.